Traditional lab tests for disease diagnosis can be too expensive and cumbersome for the regions most in need. George Whitesides’ ingenious answer is a foolproof tool that can be manufactured at virtually zero cost. The problem that I want to talk with you about is really the problem of: How does one supply healthcare in a world in which cost is everything? How do you do that? And the basic paradigm we want to suggest to you, I want to suggest to you, is one in which you say that in order to treat disease you have to first know what you’re treating — that’s diagnostics — and then you have to do something. So, the program that we’re involved in is something which we call Diagnostics for All, or zero-cost diagnostics. How do you provide medically relevant information at as close as possible to zero cost? How do you do it? Let me just give you two examples. The rigors of military medicine are not so dissimilar from the third world — poor resources, a rigorous environment, a series of problems in lightweight, and things of this kind — and also not so different from the home healthcare and diagnostic system world. So, the technology that I want to talk about is for the third world, for the developing world, but it has, I think, much broader application, because information is so important in the healthcare system. So, you see two examples here. One is a lab that is actually a fairly high-end laboratory in Africa. The second is basically an entrepreneur who is set up and doing who-knows-what in a table in a market. I don’t know what kind of healthcare is delivered there. But it’s not really what is probably most efficient. What is our approach? And the way in which one typically approaches a problem of lowering cost, starting from the perspective of the United States, is to take our solution, and then to try to cut cost out of it. No matter how you do that, you’re not going to start with a 100,000-dollar instrument and bring it down to no-cost. It isn’t going to work. So, the approach that we took was the other way around. To ask, “What is the cheapest possible stuff that you could make a diagnostic system out of, and get useful information, add function?” And what we’ve chosen is paper. What you see here is a prototypic device. It’s about a centimeter on the side. It’s about the size of a fingernail. The lines around the edges are a polymer. It’s made of paper and paper, of course, wicks fluid, as you know, paper, cloth — drop wine on the tablecloth, and the wine wicks all over everything. Put it on your shirt, it ruins the shirt. That’s what a hydrophilic surface does. So, in this device the idea is that you drip the bottom end of it in a drop of, in this case, urine. The fluid wicks its way into those chambers at the top. The brown color indicates the amount of glucose in the urine, the blue color indicates the amount of protein in the urine. And the combination of those two is a first order shot at a number of useful things that you want. So, this is an example of a device made from a simple piece of paper. Now, how simple can you make the production? Why do we choose paper? There’s an example of the same thing on a finger, showing you basically what it looks like. One reason for using paper is that it’s everywhere. We have made these kinds of devices using napkins and toilet paper and wraps, and all kinds of stuff. So, the production capability is there. The second is, you can put lots and lots of tests in a very small place. I’ll show you in a moment that the stack of paper there would probably hold something like 100,000 tests, something of that kind. And then finally, a point that you don’t think of so much in developed world medicine: it eliminates sharps. And what sharps means is needles, things that stick. If you’ve taken a sample of someone’s blood and the someone might have hepatitis C, you don’t want to make a mistake and stick it in you. It just — you don’t want to do that. So, how do you dispose of that? It’s a problem everywhere. And here you simply burn it. So, it’s a sort of a practical approach to starting on things. Now, you say, “If paper is a good idea, other people have surely thought of it.” And the answer is, of course, yes. Those half of you, roughly, who are women, at some point may have had a pregnancy test. And the most common of these is in a device that looks like the thing on the left. It’s something called a lateral flow immunoassay. In that particular test, urine either, containing a hormone called HCG, does or does not flow across a piece of paper. And there are two bars. One bar indicates that the test is working, and if the second bar shows up, you’re pregnant. This is a terrific kind of test in a binary world, and the nice thing about pregnancy is either you are pregnant or you’re not pregnant. You’re not partially pregnant or thinking about being pregnant or something of that sort. So, it works very well there, but it doesn’t work very well when you need more quantitative information. There are also dipsticks, but if you look at the dipsticks, they’re for another kind of urine analysis. There are an awful lot of colors and things like that. What do you actually do about that in a difficult circumstance? So, the approach that we started with is to ask: Is it really practical to make things of this sort? And that problem is now, in a purely engineering way, solved. And the procedure that we have is simply to start with paper. You run it through a new kind of printer called a wax printer. The wax printer does what looks like printing. It is printing. You put that on, you warm it a little bit, the wax prints through so it absorbs into the paper, and you end up with the device that you want. The printers cost 800 bucks now. They’ll make, we estimate that if you were to run them 24 hours a day they’d make about 10 million tests a year. So, it’s a solved problem, that particular problem is solved. And there is an example of the kind of thing that you see. That’s on a piece of 8 by 12 paper. That takes about two seconds to make. And so I regard that as done. There is a very important issue here, which is that because it’s a printer, a color printer, it prints colors. That’s what color printers do. I’ll show you in a moment, that’s actually quite useful. Now, the next question that you would like to ask is: What would you like to measure? What would you like to analyze? And the thing which you’d most like to analyze, we’re a fair distance from. It’s what’s called “fever of undiagnosed origin.” Someone comes into the clinic, they have a fever, they feel bad. What do they have? Do they have T.B.? Do they have AIDS? Do they have a common cold? The triage problem. That’s a hard problem for reasons that I won’t go through. There are an awful lot of things that you’d like to distinguish among. But then there are a series of things: AIDS, hepatitis, malaria, TB, others and simpler ones, such as guidance of treatment. Now even that’s more complicated than you think. A friend of mine works in transcultural psychiatry, and he is interested in the question of why people do and don’t take their meds. So, Dapsone, or something like that, you have to take it for a while. He has a wonderful story of talking to a villager in India and saying, “Have you taken your Dapsone?” “Yes.” “Have you taken it every day?” “Yes.” “Have you taken if for a month?” “Yes.” What the guy actually meant was that he’d fed a 30-day dose of Dapsone to his dog, that morning. (Laughter) He was telling the truth. Because in a different culture, the dog is a surrogate for you, you know, “today,” “this month,” “since the rainy season” — there are lots of opportunities for misunderstanding, and so an issue here is to, in some cases, to figure out how to deal with matters that seem uninteresting, like compliance. Now, take a look at what a typical test looks like. Prick a finger, you get some blood, about 50 microliters. That’s about all you’re going to get, because you can’t use the usual sort of systems. You can’t manipulate it very well, although I’ll show something about that in a moment. So, you take the drop of blood, no further manipulations, you put it on a little device, the device filters out the blood cells, lets the serum go through, and you get a series of colors down in the bottom there. And the colors indicate “disease” or “normal.” But even that’s complicated, because to you, to me, colors might indicate “normal,” but, after all, we’re all suffering from probably an excess of education. What you do about something which requires quantitative analysis? And so the solution that we and many other people are thinking about there, and at this point there is a dramatic flourish, and out comes the universal solution to everything these days, which is a cell phone. In this particular case, a camera phone. They’re everywhere, six billion a month in India. And the idea is that what one does, is to take the device, you dip it, you develop the color, you take a picture, the picture goes to a central laboratory. You don’t have to send out a doctor, you send out somebody who can just take the sample, and in the clinic either a doctor, or ideally a computer in this case, does the analysis. Turns out to work actually quite well, particularly when your color printer has printed the color bars that indicate how things work. So, my view of the health care worker of the future is not a doctor, but is an 18-year-old, otherwise unemployed, who has two things: He has a backpack full of these tests, and a lancet to occasionally take a blood sample, and an AK-47. And these are the things that get him through his day. There’s another very interesting connection here, and that is that what one wants to do is to pass through useful information over what is generally a pretty awful telephone system. It turns out there’s an enormous amount of information already available on that subject, which is the Mars rover problem. How do you get back an accurate view of the color on Mars if you have a really terrible bandwidth to do it with? And the answer is not complicated but it’s one which I don’t want to go through here, other than to say that the communication systems for doing this are really pretty well understood. Also, a fact which you may not know is that the compute capability of this thing is not so different from the compute capability of your desktop computer. This is a fantastic device which is only beginning to be tapped. I don’t know whether the idea of one computer, one child makes any sense. Here’s the computer of the future, because this screen is already there and they’re ubiquitous. All right now let me show you just a little bit about advanced devices. And we’ll start by posing a little problem. What you see here is another centimeter-sized device, and the different colors are different colors of dye. And you notice something which might strike you as a little bit interesting, which is the yellow seems to disappear, get through the blue, and then get through the red. How does that happen? How do you make something flow through something? And, of course the answer is, “You don’t.” You make it flow under and over. But now the question is: How do you make it flow under and over in a piece of paper? The answer is that what you do, and the details are not terribly important here, is to make something more elaborate: You take several different layers of paper, each one containing its own little fluid system, and you separate them by pieces of, literally, double-sided carpet tape, the stuff you use to stick the carpets onto the floor. And the fluid will flow from one layer into the next. It distributes itself, flows through further holes, distributes itself. 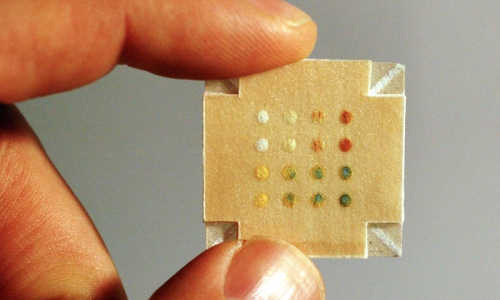 And what you see, at the lower right-hand side there, is a sample in which a single sample of blood has been put on the top, and it has gone through and distributed itself into these 16 holes on the bottom, in a piece of paper — basically it looks like a chip, two pieces of paper thick. And in this particular case we were just interested in the replicability of that. But that is, in principle, the way you solve the “fever of unexplained origin” problem, because each one of those spots then becomes a test for a particular set of markers of disease, and this will work in due course. Here is an example of a slightly more complicated device. There’s the chip. You dip in a corner. The fluid goes into the center. It distributes itself out into these various wells or holes, and turns color, and all done with paper and carpet tape. So, I think it’s as low-cost as we’re likely to be able to come up and make things. Now, I have one last, two last little stories to tell you, in finishing off this business. This is one: One of the things that one does occasionally need to do is to separate blood cells from serum. And the question was, here we do it by taking a sample, we put it in a centrifuge, we spin it, and you get blood cells out. Terrific. What happens if you don’t have an electricity, and a centrifuge, and whatever? And we thought for a while of how you might do this and the way, in fact, you do it is what’s shown here. You get an eggbeater, which is everywhere, and you saw off a blade, and then you take tubing, and you stick it on that. You put the blood in, you spin it — somebody sits there and spins it. It works really, really well. And we sat down, we did the physics of eggbeaters and self-aligning tubes and all the rest of that kind of thing, sent it off to a journal. We were very proud of this, particularly the title, which was “Eggbeater as Centrifuge.” (Laughter) And we sent it off, and by return mail it came back. I called up the editor and I said, “What’s going on? How is this possible?” The editor said, with enormous disdain, “I read this. And we’re not going to publish it, because we only publish science.” And it’s an important issue because it means that we have to, as a society, think about what we value. And if it’s just papers and phys. rev. letters, we’ve got a problem. Here is another example of something which is — this is a little spectrophotometer. It measures the absorption of light in a sample The neat thing about this is, you have light source that flickers on and off at about 1,000 hertz, another light source that detects that light at 1,000 hertz, and so you can run this system in broad daylight. It performs about equivalently to a system that’s in the order of 100,000 dollars. It costs 50 dollars. We can probably make it for 50 cents, if we put our mind to it. Why doesn’t somebody do it? And the answer is, “How do you make a profit in a capitalist system, doing that?” Interesting problem. So, let me finish by saying that we’ve thought about this as a kind of engineering problem. And we’ve asked: What is the scientific unifying idea here? And we’ve decided that we should think about this not so much in terms of cost, but in terms of simplicity. Simplicity is a neat word. And you’ve got to think about what simplicity means. I know what it is but I don’t actually know what it means. The above video is based on materials provided by TED.